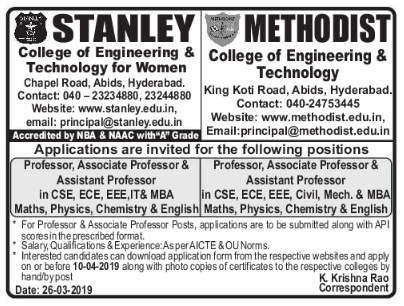 Methodist College of Engineering and Technology, Hyderabad has advertised in the EENADU newspaper for recruitment of Professor / Associate Professor / Assistant Professor jobs vacancies. Interested and eligible job aspirants are requested to apply on or before 10th April 2018. Check out further more details below. About College: Methodist College of Engineering & Technology is a Non-Minority Educational institution, established in the year 2008, over 6.53 acre sprawling campus, situated at Abids, in the heart of the city of pearls, Hyderabad, Telangana. The college is well connected by public transport from every corner of the city. MCET is affiliated to Osmania University at the state level and with AICTE in the Central level. Life in Methodist is not just limited to the classroom-teaching, but spins beyond the textbooks to develop character and thus mould the total personality of the students to carve a niche for themselves in the society. So join Methodist, to study engineering course in one of the top engineering colleges in Hyderabad, we promise the best experience of engineering study with us. Methodist with all the outstanding facilities and infrastructure it stands as the best Engineering College in Hyderabad region.